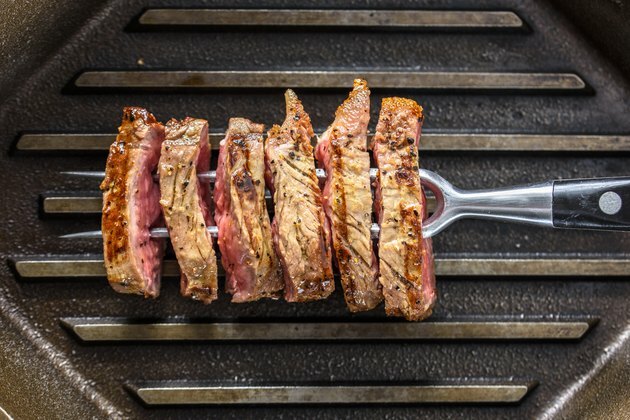 Seasoning a grill has no relationship to seasoning the steak or eggplant you're grilling. In the latter case, you season to add flavor to the raw food item. But when you season a cast iron grill, you're not adding flavor. It actually refers to the process of coating the grill grate with oil, then heating it, to render it rustproof and create a virtually nonstick surface. Depending on the type of grill you own, you may only need to season the grill the first time you use it and occasionally after that. And with a Weber brand grill, you may not need to season it at all. If you've purchased a new Weber grill, the company says that seasoning the cast iron grates isn't necessary. A porcelain enamel coating is already added to the cast iron so you don't need to season it at all. Instead, they recommend that when using a grill for the first time, you turn up the heat for about 15 minutes, then brush it clean with a stainless steel bristle brush. If you happen to be using an older Weber grill, or any other type of barbeque grill that wasn't coated with porcelain enamel, you'll need to season it before using it for the first time and sometimes reseason after seasonal storage. For example, when using a gas barbeque for the first time, always season it unless the directions specify not to. The procedure is the same for charcoal grills as for gas grills since it's the cast iron grates you're seasoning, not the gas or charcoal component. To season the grill, rinse the grill grate with plain water, then dry it thoroughly. The next step is to apply a fat – either vegetable oil or shortening – to the grates, coating all of the cast iron with it. Place the grill grate over a cold grill, then slowly increase the temperature to about 400 degrees and keep it there for about 40 minutes. Finally, allow the grill grate to cool. Reseasoning the grates of a grill occasionally is a good idea. While some people reseason after every cookout, you don't need to go that far unless you want to. Consider reseasoning after every four or five barbecues or prolonged storage. You reseason by adding more of the oil and again letting it bake into the cast iron.